Enjoy a great summer dinner on the grill. Whether it is from the garden or the farm stand this dinner is fantastic and easy to make. Season the meat with fresh ground pepper, salt, and garlic powder. Soy sauce is optional. Combine all vegetables except tomatoes and peaches, and toss with Balsamic vinegar with a liberal amount of fresh ground lemon pepper. Season peaches and tomato separate and keep aside. 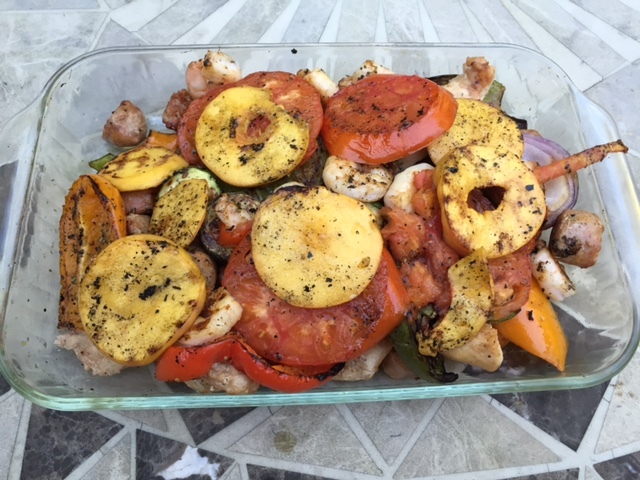 A grilling tray is a must for this dinner. Oil your grill before setting the meat to cook. I like to cook the meat first for 5 min., then the vegetables and the fruit and tomato last. Enjoy!